Zachary with spots. February 2002. 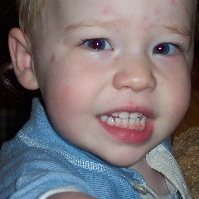 Zachary’s chicken-pox spots are fading now, so he is probably past the most infectious stage. This photo is from the first seriously full-on day of spots, last Thursday.